This past weekend was another beach weekend. It was Miss Hayley's idea. 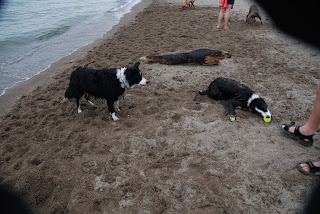 How do you know when your dog wants to go to the beach? 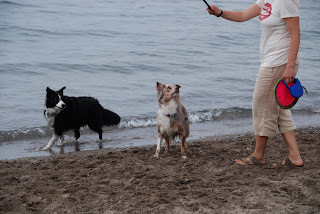 Well, the little flip flops, straw hat with holes for the pricked ears and the sunglasses on the border collie were a give away. 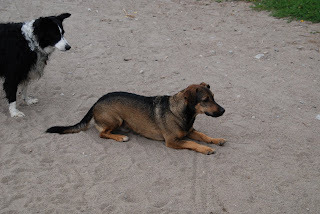 One of the new elements in the sequel was the introduction of a character from Hayley's park movies: This is Caine, part of the group of dogs that come to our local dog park. As always, when Hayley finds one of her doggie buddies in a new context/location, she was totally convinced that Caine was lost and it was her duty to herd him back home. 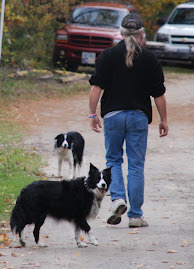 We also came across a guy with his own pair of border collies. One was a senior, around nine years and the other was under two . These are what I call "twitchy" borders; so wired for action they twitch. The nine year old female would bring me her ball to toss and would lay her head down, ball in her jaws, her mouth twitching the whole time ... I don't know if the ball was the sheep or I was. 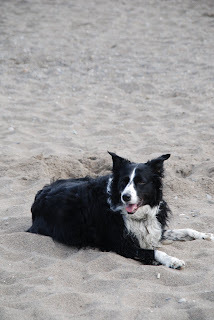 And I suspect there must be some kind of bi-law restricting the number of border collies allowed on the beach at one time; get too many and you'd have groups of sun burnt tourists all huddled together, up and down the sand. One of the interesting things that happend while we were there was a bird behaviour I had not before witnessed. A long line of birds built up out on the lake, very close to the water, pretty much on the surface. 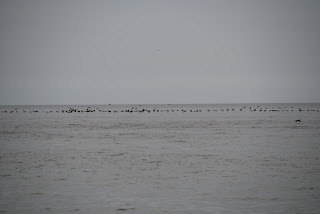 The line of birds stretched almost across the entire horizon. We think the birds were cormorants. As they flew along in this line, you could see them lifting and moving as they ... apparantly .. changed position. This went on pretty much for most of the three or four hours we were there. Not really sure what this is all about. Mating ritual? Seasonal behaviour? Big sale at The Gap? Who knows. So here is the little video of the day. There are a couple of good shots of the birds, I think. 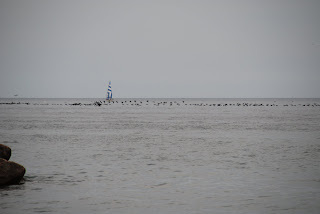 We are not positive that they are cormorants, the distance made it difficult to see . If anybody has any idea about what this is, please feel free to leave a comment or e mail. Me being me I have a theory: Either its the end of the world and the cormorants know it or: The day hold donuts just came on sale at Tim Hortons. Beach Two from Victor Kellar on Vimeo.